Just as the sun was setting on the summer of 2014, the industry had one of its best performances of the year in September, posting sales gains of nearly 10 percent in the main powerboat segments and across the industry. 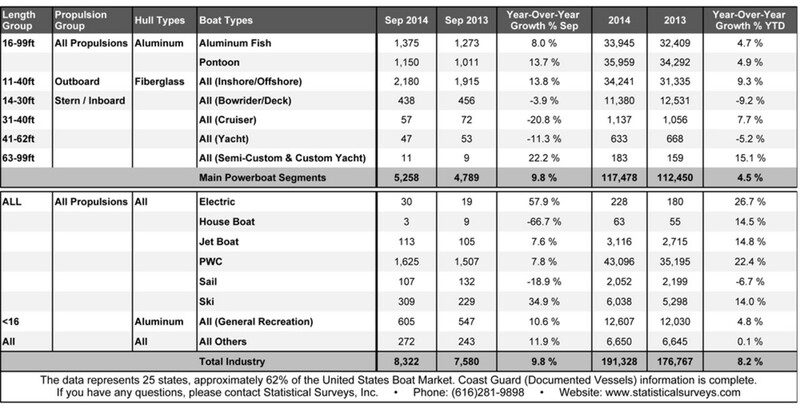 Led by stalwart post-recession categories such as aluminum fishing boats and pontoons and fiberglass outboards, sales climbed 9.8 percent, or 469 boats, to 5,258 in the main segments and by an identical percentage, or 742 boats, to 8,322 industrywide from the same month last year in 25 early reporting states that represent 62 percent of the national market, Statistical Surveys reported today. The figures compared with an even more robust September last year, when sales in the main segments were up 18.3 percent and industrywide sales climbed 19.9 percent. Statistical Surveys national marine sales manager Ryan Kloppe said anecdotal reports of a selling season that gained momentum after the bitter and lingering chill of last winter and the early spring were reflected in the sales increase last month. Through September, industrywide sales in the early-reporting states are up 8.2 percent, or 14,561 boats, at 191,328, putting the industry on a pace that would easily eclipse its 2013 total of 207,277. Fiberglass outboards posted the best results among the main segments, with sales surging 13.8 percent, or 265 boats, to 2,180. Sales of 14- to 30-foot inboard and sterndrive fiberglass boats continued to lag other segments. Sales of 438 boats were 3.9 percent lower than in September last year. However, Statistical Surveys also said that sales of sterndrives 23 feet and larger are up 4.5 percent for the year through September, or 146 boats, to 3,388 in the early-reporting states. Sales were higher in six of the top 10 states in September this year than they were in the same month last year. Florida was the sales leader with 1,893, a gain of 400. Texas ranked second at 1,395, a gain of 214, and Michigan was third at 571, a gain of 117. North Carolina had sales of 520 boats, a drop of 69, and sales totaled 492 in South Carolina, a gain of 101. Rounding out the top 10, sales were lower in California (416, down 116), Tennessee (307, down 35) and Minnesota (299, down 75) and higher in New York (274, up 25) and Washington (258, up 39). The Coast Guard was up to date in its reports of documented vessels, providing a complete picture of sales in the low-volume bigger-boat categories. Sales of 31- to 40-foot cruisers fell by 15, to 57, sales of 41- to 62-foot yachts fell by six, to 47, and sales of 63- to 99-foot yachts rose by two, to 11. Among smaller vessels, sales of personal watercraft climbed 7.8 percent, or 118 units, to 1,625, and sales of jetboats rose by 7.6 percent, or eight, to 113. Ski-boat sales climbed by 34.9 percent, or 80, to 309. It was another September sales number that Kloppe singled out as impressive. “I know this is a small segment, but it continues to show double-digit growth every month,” he said. Sailboat sales fell by 25, or 18.9 percent, to 107.